The Exorcist: Legion VR lives up to its legendary horror pedigree in every way possible. I am not being hyperbolic when I say that The Exorcist: Legion VR frightened me more than any other video game I have ever played. I don’t mean that I fell victim to a few jump scares, and I’m not saying that I was momentarily startled by something lurking in the shadows of the game – I mean that for a few earnest moments of legitimate emotional reaction, I was freaked out enough to leave my own house. I had internally questioned myself a little bit before playing as to whether or not pursuing this game by myself, alone in my house, was a good idea, but in the end I decided that I was a big boy, and I could take it. I hate to say it, but I’m not a big boy, and I could not take it. There is a moment in the fifth chapter of The Exorcist: Legion VR that caught me completely off guard and made me absolutely lose my mind. I’m not going into specifics, because I don’t want to ruin it for future players, but I will say that for a few seconds, I forgot that I was in VR, and I was filled with a very real, very visceral panic. Overcome with the need to escape (and forgetting that I was seated), I physically scrambled away from the figure that I felt was certainly going to kill me. And I quite literally tipped over backwards in my chair, crashing to the ground in a heap. Chapter Five takes you into the tombs of Mesopotamia – where all the cool kids hang out. I ripped the PlayStation VR headset from my skull, and cursing the evil masterminds at developer Fun Train and Wolf & Wood, I stood alone in my silent living room, panting to catch my breath. The house creaked around me as the autumn wind distantly whistled through the trees outside and it felt as though the room I was standing in was breathing as I breathed. I realized that I had made an error in playing The Exorcist alone in the house. My living room, where I rest and play games and watch television every day, suddenly felt dangerous and foreign. And so I left, walking outside into the brisk air and sunshine, strolling around the block to grab a bag of peanuts, getting my head straight before going back in to finish The Exorcist. I am not exaggerating, The Exorcist: Legion VR is the single most frightening game I have ever played. No other game (or for that matter, film or book) has ever scared me enough to elicit a physical response of this nature. I absolutely love it. The Exorcist: Legion VR is an episodic game, with the first three episodes released back in July. These chapters were followed by episodes four and five, which were released together a few weeks ago. Taken on their own, the episodes are not very long. 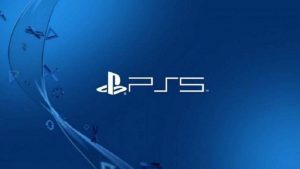 During the first play through, episodes may take about 45 minutes to an hour apiece, particularly if players are taking their time and peeking into all of the nooks and crannies of the extremely well rendered environments. Due to the shorter nature of the episodes, I would recommend that newcomers to the series forego the episodic format and simply buy the season pass. I guarantee that if you play one episode, you will want to see the series through to the end. The Exorcist: Legion VR is a series that just feels like a cohesive and whole game when played end to end. By purchasing the entire package you will be doing yourself a favor and saving a bit of money. Churches in The Exorcist are holy ground – safe from demonic attack. This is just the aftermath of a wicked awesome party. The Exorcist: Legion VR is a lesson in smart licensing. The team at Fun Train did not license the entire Exorcist franchise. Rather, they got the license to the third (and arguably best) film in the series, thus buying themselves a sideways ticket into The Exorcist name and lore without having to shell out the big bucks for the original film. Thus, players will not be running into Father Karras or Regan MacNeil. There are no spinning heads, spider crawls, or bedroom showdowns (though the team does sneak in a cheeky pea soup reference). Trust me, there are plenty of other demonic images that Fun Train manages to throw into players’ faces; the original flavor Exorcist is not missed one bit. The five chapters have been sewn together within a very clever framework. 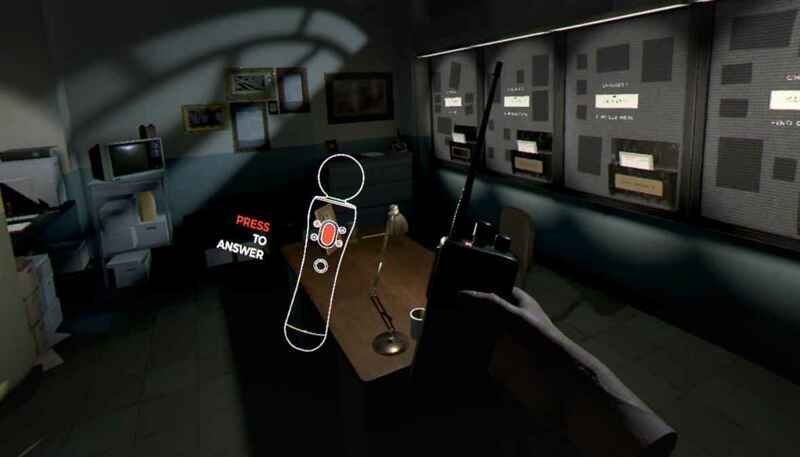 The player fills the shoes of a Boston Police detective (who is willing to operate wildly outside of their jurisdiction, conducting investigations in foreign countries without blinking). 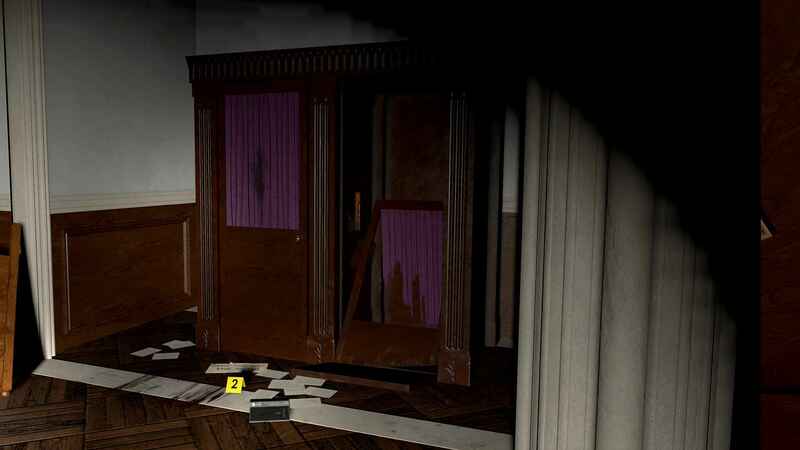 The game starts in the police department, and each chapter plays out as the player travels to a crime scene to conduct an investigation. In between chapters, the detective receives packages delivered to their office, foreshadowing events to come. This narrative device feels extremely well thought out, as it offers players a safe space; a place to catch their breath before diving into the next foul investigation. Each investigation starts out innocuously, but it isn’t long before sinister forces make themselves known. 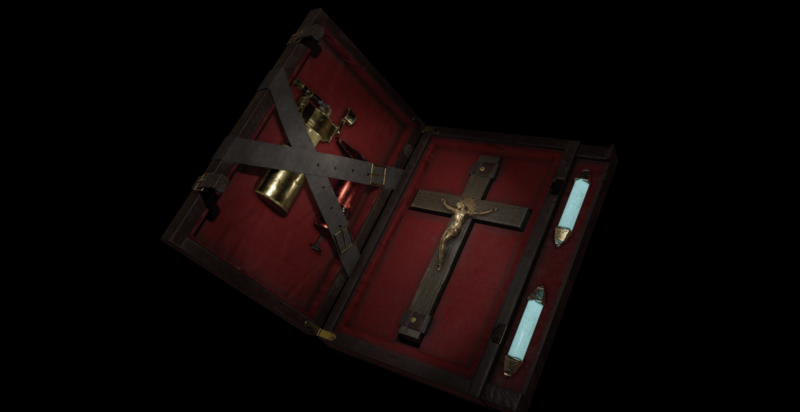 During the first chapter, players find and equip the faith-based articles that they will carry with them on every investigation (a cross, holy water pellets, salt spray, stuff like that). These item come in extremely handy, both as tools to solve environmental puzzles and as psychological shields against the evil forces at play. I don’t mind saying that I skulked through every chapter holding my cross out in front of me like Van Helsing in Dracula’s castle. At the end of each chapter, after the game has put the player through a hellish wringer, there is a showdown with a demon. This generally involves figuring out where the demon resides, and then using a combination of your holy instruments on them until they are banished (and if you are me, screaming obscenities at demons while you are alone in the house). Though these final battles are not overly difficult, I still sometimes felt woefully under-powered. I am a detective, after all, and these are demons. The environments that these confrontations take place in are stunningly realistic, to the point that I feel comfortable in saying that this is one of the best looking games on PlayStation VR. Even the police station is beautifully rendered, with moon-rays filtering through overhead windows, lighting dust motes in the air in the process. The Exorcist: Legion VR is a game that did not have to look this good to be successful, but the fact that it is beautiful, using light and shadow in groundbreaking ways, is a testament to the care with which this game was crafted. An advanced physics engine also adds to the sense of realism in the settings. If you pick up a ball and throw it, it bounces realistically. If you get down on the floor of a child’s room to play with blocks, you can stack them, then knock over the stack. It’s subtle but impressive stuff, and surprising to see in a game of this nature. Fun Train did not have to add this level of interactivity to The Exorcist: Legion VR. 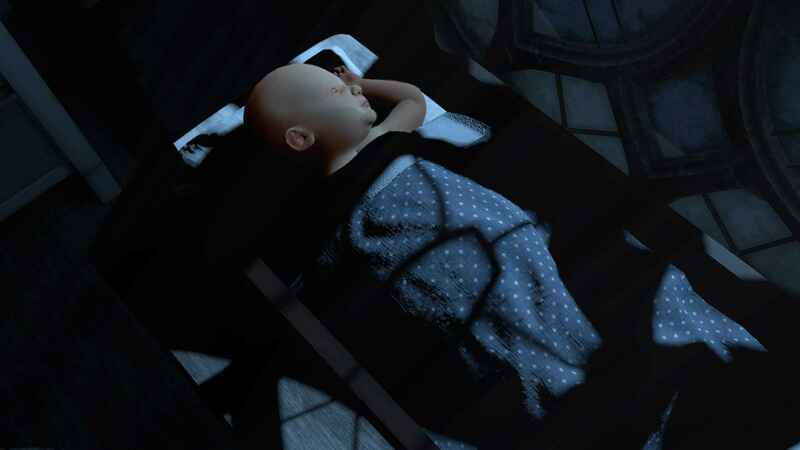 The child-care sim aspects of The Exorcist: Legion VR offer a welcome change of pace. Though I played the first three episodes last summer, they are still crystal clear in my mind. Deeply impressed by the earlier installments, I was excited to play the final chapters to see if Fun Train had stuck the landing. I am happy to say that content-wise, these new chapters are on par with the earlier installments (though nothing tops the third chapter as my personal favorite). 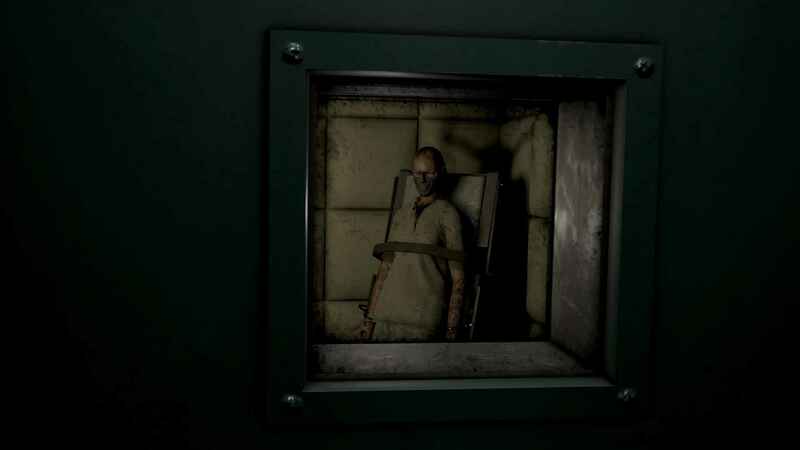 They deliver some superbly creepy moments, and as I mentioned above, some extremely visceral scares. Though the final showdown in the fifth chapter is deeply memorable and though it boasts some outstanding creature design, I found the fourth chapter to be even more atmospheric and chilling, with the detective descending into a space that felt utterly foreboding and forbidding. This guy is showing off his impressive “bunny shadow” trick. Go on in, its super fun! I did find that I had some technical problems with the later episodes, however. The turning and teleporting mechanics seemed to be a bit glitchier than I remember them being. Some of the objects that I tossed around the environment seemed to be missing sound effects. And I ran into some situations where I found myself losing objects embedded in solid walls. When you are deep in a dark tomb below ground, and you accidentally drop your torch inside a wall, it can be a game stopper. So I did feel like I was fighting the game a bit as I was fighting demons. But The Exorcist: Legion VR is not a game that lives or dies on its technical prowess. This is a game that has set up one of the world’s most terrifying funhouses, and dares players to walk through it. 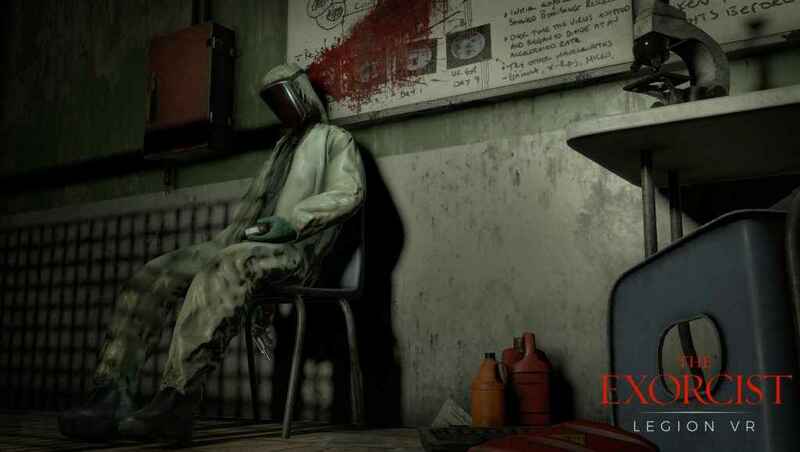 The gameplay does not matter as much as the pervasive creepy atmosphere and the sudden, wicked thrills. Horror fans, VR fans, Exorcist fans, fans of putting VR headsets on their grandmothers to torture them on YouTube; this game offers something for all of these folks. To say that The Exorcist: Legion VR is one of the scariest games on PS VR is not giving it enough credit. The Exorcist: Legion VR is one of the best games on PS VR, period. 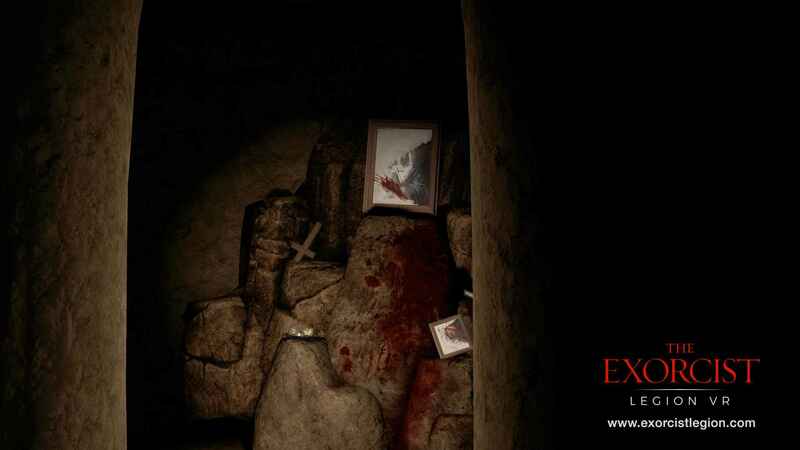 To find out more, check out The Exorcist Legion VR interview. Fun Train has delivered a game that, for a franchise title, is surprising in its quality. Though there are some minor technical hiccups, content-wise, this game stands with the best offerings of its legendary franchise. It is often said that The Exorcist is the scariest film ever produced. The Exorcist: Legion VR is scarier.